It had been a horrible business meeting. Lots of anger, accusation, and tears over who knows. Drama. Territorial disputes over imaginary things. I could feel the anger coming off of one person like a solar flare. The individual that she was really mad at was sitting right next to her, but there was no eye contact with that person. No, I got to have the fun, because I was sitting on the other side. I got the evil eye. I ended up feeling personally attacked. I loathe passive aggressive behavior. It is unproductive in every situation. The real issue is never addressed, but by gosh, we all will suffer. I am about positivity these days, and speaking up for myself. However, I am not in charge. So I had to listen while all that "stuff" was splattered on me. When I walked out of the building and into the heat of the midday, I was still angry and tense, and I could hear myself muttering as I got into my car. A cheeseburger was in order. I went into the burger place and got in line, still feeling surly. I realized that I needed to calm down before I went home, but how? And then I saw it. Through the window of the beer fridge. Shiner Bohemian Lager. 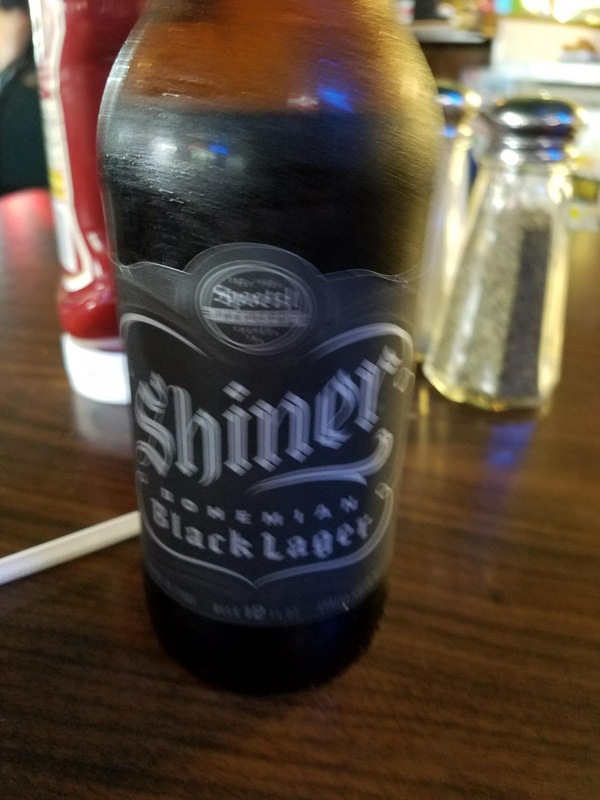 A wonderful and smooth beer, made in Texas. My favorite. Should I have one? I could say that I bought American, and not be lying. Should I have one? I would have to wait for them to cook my food, anyway. Should I have one? Yes. But I felt guilty about it. The teenager at the register was thankfully patient while I paid. I was still having an inner dialogue about the beer issue. I put the beer down on the table and sat down. I stared at the bottle, a little bead of sweat on the neck. Nobody drinks beer before 5pm on a weeknight unless they are an alcoholic. Was I? No. Where did this particular guilt come from? I don't know. Sometimes random things, a TV show, a movie, a book, becomes associated with an emotion, I suppose. You carry it in the back of your mind, underneath a few scary childhood memories, and occasionally it jumps out like your garden variety boogeyman. Live in the moment, I told myself. I was off work and on my way home. I'd had a hard day, and I needed to sit and contemplate the wonder of things. One single beer was not a big deal. I picked up the bottle and took a sip. And another, just letting the taste roll over my tongue. Every slow swallow took me one step away from the drama. The world did not looks so scary. "Do you need anything, ma'am?" The manager asked me. I took another sip. She smiled. "Are you decompressing, by any chance?" . I smiled. The idea that I might not be the only person dealing with other people's junk was the last push of distance I needed to break free of the horrible morning. Decompressing felt like the perfect word. I smiled at her. She smiled back at me. "Yes, I am decompressing," I replied, raising my bottle in a toast to her word choice. I smiled at her. She smiled back at me. "Take your time, then." The manager walked back behind the counter, and I sat, and contemplated the wonder of things. It's 5 o'clock somewhere. Bad moods are contagious. If it takes a beer to kick you out of the funk, good.